From The Library Of Embosser - Open Book Embosser - Custom Embosser. You are able to customize both the top and bottom line of the embosser. We recommend that text to be in ALL caps because this makes the letters more legible when your library embosser presses down. Please note that the quality of your library embosser impression will depend on how much force you use. Size of embosser is 1.65" in diameter. 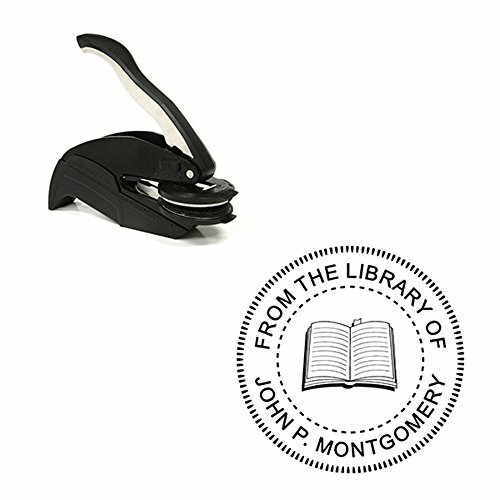 This Custom Library Embosser is for 20lb paper or stationary exclusively. Embosser inserts are constructed of delrin (Polyoxymethylene) to give a precise impression when embossed. This design will go on a brand new pocket embosser. Embosser set includes the entire embosser casing and embosser insert that has the art.